When the second season of the Overwatch League kicks off in mid-February 2019, eight new teams will be joining the roster of two divisions. 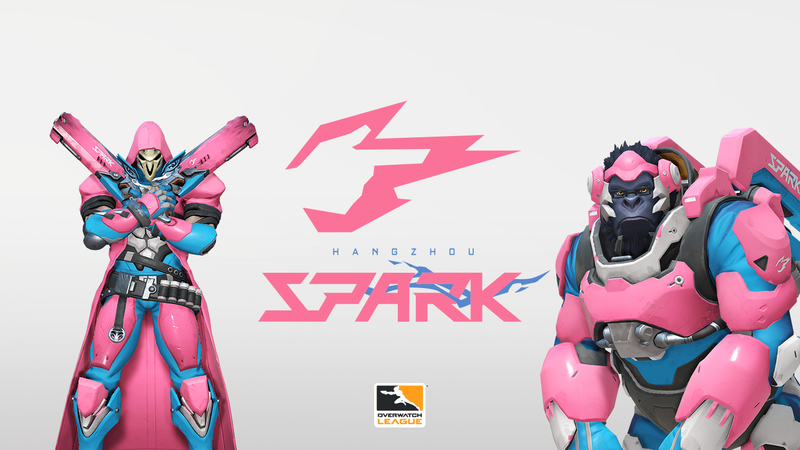 Earlier this week we reported on the official unveiling of the Chengdu Hunters, and now we've had our first look at the in-game branding that will be assumed by newcomers Hangzhou Spark. According to a press release issued by owners Bilibili, the “vibrant” pink, white and blue colours have been chosen to represent the fast-growing destination city of Hangzhou. “After two months of preparation, we’re proud to finally introduce the Hangzhou Spark to the world,” she began. ”We’re excited to show off two Overwatch heroes in Spark skins. We hope the fans love pink Reaper and Winston. “We’ve staffed the team with world-class players and coaches. We’re confident in how the team will perform and we’re excited to see them in action when the 2019 season starts. Season 2 of Overwatch will be a slightly less intense affair for the teams involved, with fewer matches per week - and longer breaks between encounters - to help players recover and spend more time engaging with their fans.